Peal and chop bananas to small peices. 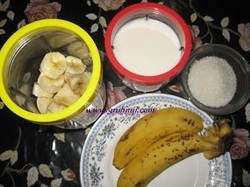 Make a smooth paste in a blender adding a cup of milk to it. Now add sugar and vanilla essence and whip until it becomes frothy.